In early 2015, the law firm of Morgan and Morgan filed a class action lawsuit against Purina over ingredients found in its line of Beneful dog food. Despite this lawsuit — and the thousands of complaints of kidney failure that led to it — the products remain available to purchase at a store near you. Of the pet owners we surveyed, 70 percent admitted that they didn’t know all of the ingredients in their dog’s food — including the very ingredients at the heart of the Purina lawsuit. All dog foods claim to be “premium” and “all natural,” but with very few regulations on what it takes to meet these qualifications, many of these claims are little more than flashy marketing gimmicks and false advertising. 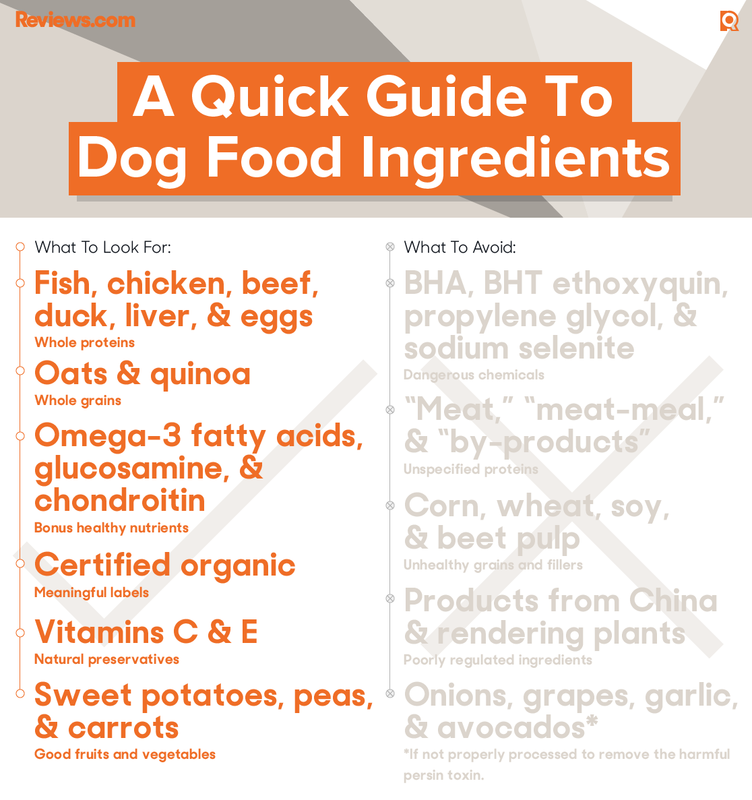 So, we dug behind the label to sort out which ingredients make an excellent dog food and which ones should be avoided. At the end of the work, we settled on 134 formulas across 29 approved brands. Ten people on our team dedicated full-time work to this project, investing over 1,400 hours into this single page. We built a list of over 11,000 people with connections to the dog food industry and narrowed it down to the best. Over 20 experts contributed their valuable time to our work, including veterinarians, dog trainers, animal behaviorists, university researchers, and authors. We surveyed 300 dog owners and asked them if they knew what was in their dog’s food. We gathered a list of over 8,000 search queries to find out what matters most to dog owners. We read and analyzed 72 of the most popular articles and studies on dog food. We compiled a list of 2,223 formulas from 115 brands and reviewed their ingredients. Bad ingredients make dog food unsafe and unhealthy. Safety has always been the biggest concern for pet owners — and one of the hardest challenges for dog food manufacturers to meet. Since the 2007 recalls on Chinese-sourced food, many consumers have started reading labels to see where their food was coming from, but even ingredients sourced in the US can be unsafe. The Association of American Feed Control Officials (AAFCO) sets and maintains standards for the proper levels of ingredients in pet food, but it’s the Food and Drug Administration (FDA) that determines the quality. FDA regulations, however, don’t guarantee that all ingredients will be safe. Ingredients from rendering facilities, for instance, should be avoided. You’ll recognize these ingredients on the label under generic, non-specific terms like “meat” and “meat meal.” In California, manufacturers have given them the appetizing name of “dry rendered tankage.” So why avoid them? It’s almost impossible to tell what’s being rendered: It can be roadkill, zoo animals, and sometimes even spoiled meat from the grocery store that’s still wrapped in plastic. The experts we spoke with have seen a direct correlation between poor diet and many health problems in dogs. Most of these problems tie back to low-quality ingredients in dog food, but safety is still a concern. Digestive problems, including bloat and inflammatory bowel disease (IBD), are symptomatic of poor ingredients that don’t contain enough whole, unprocessed foods. Food allergies can also lead to digestive issues — many of the experts we reached out to have seen evidence that dogs are sensitive to wheat and corn, both popular fillers. Obesity is on the rise in dogs. One main reason for this is overfeeding, but many of the experts we talked to were quick to point out that poor grain-based ingredients are also to blame. The first step in choosing the best dog food for your pet is to identify the bad ingredients in dog food. From there, you can combine that knowledge with an understanding of what good ingredients to look for. The experts we spoke to weighed in. Scientific evidence has yet to show whether or not a raw, homemade diet is the right choice for dogs. However, about half the experts we spoke to are in favor of feeding their pets a raw diet. As a pet owner, there are several factors that play into feeding your dog a raw diet that you need to consider, like preparation time and ensuring you don’t feed your pet a harmful human food. When we made our picks for the best dog foods, we looked at all varieties: dry, wet, homemade, dehydrated, and frozen raw varieties. No matter the type of food, the most important determining factor is still the ingredients. After that, what matters is what’s best for you and your dog. Your dog’s life stage should factor into his or her diet. Puppies and seniors both have specific dietary needs. Large-breed puppies can develop developmental orthopedic disease (DOD) if they eat too much calcium — the maximum amount of calcium listed in their food should be no more than 1.5 percent. Senior dogs often require less protein because they are less active. And if they suffer from arthritis, many formulas contain glucosamine and chondroitin, both of which alleviate joint pain. Some people say age-specific formulations are simply a marketing tactic. Just about all the experts we spoke to believe puppies and older dogs have specific nutritional needs that need to be addressed through diet. According to the experts we interviewed, there’s no indication that specific breeds need specific diets. What you feed your dog is dependent on his or her size and activity level. Foods formulated specially for small dogs, for example, are beneficial because the smaller pieces of kibble are easier for them to eat and digest. Dog owners need to be as careful as ever. After putting in 1,400 hours of research and analyzing over 2,223 formulas, we discovered even some of the most popular brands still make food with unhealthy or unsafe ingredients. Of the 2,223 formulas we looked at, only 134 met our standard of approval — about 6 percent overall. With so many choices on the market, it’s as important as ever to read labels and make informed decisions. The good news? There are 134 great formulas to choose from, and they represent the best of what the industry has to offer. Because we did, in fact, want to offer the best in the industry, we made these considerations with a distinct focus on quality — and without an emphasis on cost to the consumer. We understand that the price points of our top-rated choices may be higher than the average unit price in the industry, and might be simply too costly for many consumers. Still, our goal was to surface other key considerations — like ingredients and history of handling recalls — when deciding which formula is best for your dog. Moving forward, we also hope to provide more clarity around affordability, as well. We removed products where the first ingredient is not a meat of any kind. We removed products containing corn, soy, wheat, grain, or flour. We removed products containing beet pulp or sugar. We removed products that contained by-products or sauces. We reviewed brands for recalls, ingredient sources, history, and customer satisfaction. We reviewed the remaining formulas based on the best ratio of protein, fat, and carbs, as well as the source of protein. Ingredients matter most, so we started by eliminating formulas with ingredients we determined to be unhealthy, unsafe, or unfavorable. It was important that each formula have a meat protein listed first — we removed 194 dog food formulas based on this criteria. We next removed 578 additional formulas that had corn, soy, wheat, grain, or flour in any part of the ingredient list. Overall, this eliminated 772 formulas, taking us from 2,223 to 1,447. Next, we took out all formulas containing beet pulp or sugar, eliminating 146 more and further reducing the number from 1,447 to 1,301. Formulas that contained by-products and sauces led to 44 additional cuts, narrowing our choices from 1,301 to 1,257. The 1,257 dog food formulas left did not have any ingredients we wouldn’t feed our own dogs. This was too large a number, however, so our next step was to review the brands themselves and return to formulas later. 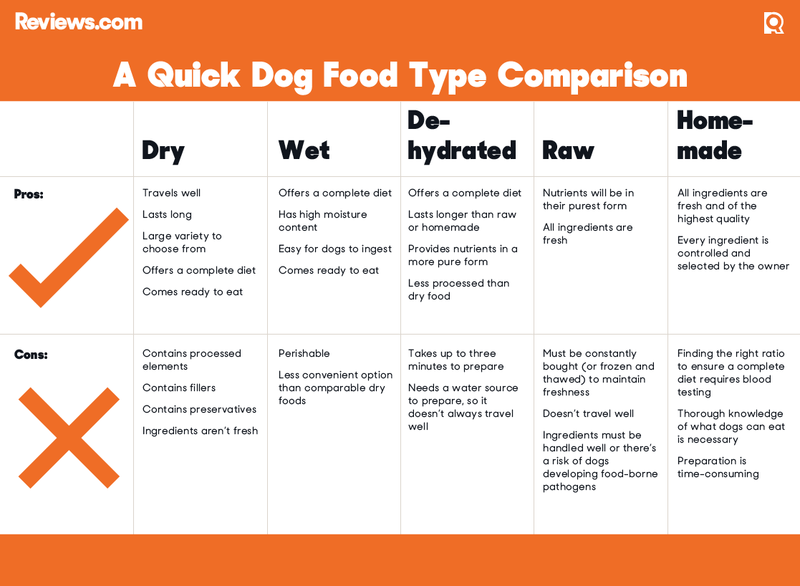 The original 2,223 dog food formulas we analyzed comprised 115 brands. But after reducing the number of formulas to 1,257, the number of brands dropped to 93. Of the 93 brands left, we went straight to their recall history to look for any major recalls, any significant controversies, and unusually high numbers of customer complaints and reports. Next, we took out brands that had been sold to large companies and, as a result, may be changing or have changed their formulas in a manner that compromises integrity. Just as in human food, often, acquisitions and changes in ownership can lead to changes in formulas and manufacturing processes. In dog food, that can mean dramatically different ingredients that pet owners may not even notice. For this reason, we eliminated dog food brands that had recently been acquired by large companies like Procter & Gamble (P&G), because we couldn’t guarantee that the data we had on them, or the ingredients listed, were up-to-date and reliable. Holistic Select: Holistic Select’s parent company, WellPet, no longer has any ties to Diamond. However, Holistic Select has still received customer complaints of gas and loose stool in pets. Wellness: Was associated with Diamond’s 2012 massive recall, but has since cut ties with Diamond. We’ll revisit Wellness in the future. Weruva: Some of their products are made in Thailand. Wild Calling: Food is manufactured and packed by Evanger’s. We understand our methodology isn’t perfect, and we continue to evaluate it each day, especially when it comes to recalls. We took a hard stance on not including brands that had a history of multiple recalls. Though recalls happen, not all companies respond as swiftly, carefully, and transparently as we’d like. Which means that even after a problem is corrected, they may continue to cut corners, which could lead to future safety concerns. So while a recall in and of itself isn’t necessarily the last straw for a dog food company, a slow or sloppy response is. In our research, we didn’t initially look at recall response, but we’re adjusting our judgments on a case-by-case basis. That doesn’t mean the products from these brands are worse than the products from brands on our recommended list. Many of these products pass all of our tests when it comes to assessing quality ingredients. Some of the recalls were created proactively by the brands themselves, meaning there were no incidents reported. Still, we had to draw the line somewhere, but we plan to continue to modify and improve our methodology over time. On that note, we also removed any and all products that had previously been associated with Diamond brand dog foods. Diamond pet foods have a history of recalls, including one extremely large and dangerous incident in 2012, which impacted many of its smaller labels. Dog foods that appear to be of higher quality, like Taste of the Wild, Canidae, and Solid Gold, were all involved at the time, though many consumers were unaware that these particular labels were associated, and several brands have since separated from Diamond and its manufacturers. We did not feel that Diamond was transparent or diligent enough in its response to meet our criteria. For this reason, we initially excluded dog foods that were owned or manufactured in Diamond’s factories, because we just could not assure their ongoing safety. However, we are reconsidering those brands that have severed ties and found new manufacturing locations on a case-by-case basis, based on the visible work the brand has demonstrated. We’ll continue to consider these brands moving forward, but maintain our hard stance on recalls. This left us with roughly 300 remaining formulas. The final step was to determine if they had the proper ratio of protein, fat, and carbs based on our research. And we made sure the largest source of protein came from an animal. After reviewing all 2,223 formulas, we ended up with 134 dog food formulas — manufactured by 29 brands — that we confidently recommend. Wondering why your dog food didn’t make the list? We went by a very rigid and specific review methodology that brought our list from 2,200-plus dog food formulas down to 134. If your dog food is missing from our list of 134, it is most likely because it didn’t meet the requirements set forth within our review methodology. If you think that there has been a mistake, please let us know by tweeting @reviews and we will fix the mistake and update our review!